By clocking in or out, employees will be registered as present or absent. In the menu on the left, under ‘time registration’, you can go to the ‘who is inside’ list. Here, you can see which employees are present and which are absent. In the settings, you can determine whether other employees can also see this list. In case they are allowed access, they will be able to see from their own desk whether their colleague is at work at that moment. This can also be used in case of an emergency. who is present in the building. Employees and managers can only see those colleagues which they are allowed to see in the leave calendar. 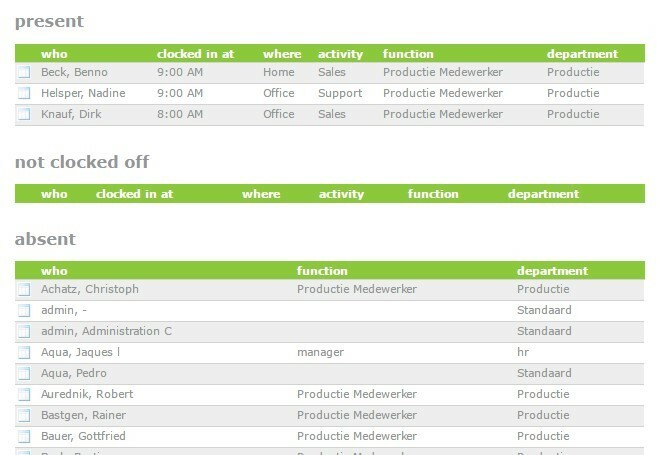 Select the calendar icon next to an employee to see an overview of all their timed hours.